The DFG Office in São Paulo serves as an administrative branch and point of contact for advising and mentoring local researchers and research institutes. It already boasts a strong regional network of partner organisations. This cooperation between institutions facilitates the initiation and execution of joint and co-funded research projects in all scientific fields. 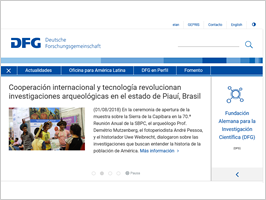 The DFG Office Latin America now offers comprehensive information about the DFG and its programmes in Spanish and Portuguese. The El Colegio de Mexico will held an International Summer School, which will be taught in English and focuses on the study of Mexican and Latin American realities as approached by the faculty at COLMEX. Application deadline: April 12th. Latin America’s scientific potential is constantly growing, and the region is becoming increasingly significant for science. Interest in cooperation with research partners in this region is growing considerably among German researchers. This applies particularly to the countries of Brazil, Mexico, Chile, Argentina and Columbia, whose scientific systems are very advanced. São Paulo is an important research and economic location, and the 2011 establishment of the DFG’s Latin American office there under the auspices of the DWIH (German House of Science and Innovation) will enable its strategic development to be effectively expanded and developed further. The cooperation between partner organisations facilitates the initiation and execution of joint and co-funded research projects in all scientific fields.